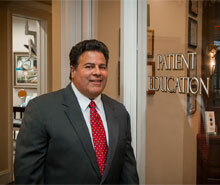 ABOUT MICHAEL T. COLLETTI, D.D.S. Whether you visit us for a teeth cleaning, cavity care, teeth bleaching, laser teeth whitening, dental crown, bonding or veneer for teeth, dental implant or tooth extraction, we offer you the best of dental care in professional yet comfortable surroundings. Regardless of your age, experience in the dentist chair, or pain threshold, Dr. Colletti and his staff will assist you in the areas of general dentistry, endodontics, periodonotics, orthodontics, cosmetic dentistry, esthetic dentistry, sedation dentistry or general dental hygiene. Dr. Colletti is a member of the American Dental Association, Illinois Dental Society, Chicago Dental Society, International Dental Laser Association, American Association of Functional Orthodintics, Academy of General Dentistry, U.S. Chamber of Commerce, and the Knights of Columbus. A widower who was blessed with 21 years of a wonderful marriage to Jean, the doctor continues to cherish his time with daughter Kristen and son Vincent. In his spare time, Dr. Colletti enjoys trips to Florida in the winter and Alaska in the summer to pursue his passion for golf and fishing. What Dr. Colletti also loves doing is practicing General Dentistry, as he considers it a privilege to have his patients place their trust in his care.